Store profile: Hunt Country Jewelers. I recently had the pleasure of visiting Hunt Country Jewelers: a second-generation family owned gem of a jewelry store in picturesque Purcellville, VA, and I can’t wait to tell you all about it. First things first: the setting. Purcellville is a beautiful little town in the heart of Virginia wine country. Rolling hills, wide skies, friendly residents, wine everywhere. It’s worth visiting on its own. Hunt Country Jewelers is right in the middle of the town, across from a distillery. It’s a bright, open, thoughtfully-designed space that feels like a gallery without the standoffishness. Warm wooden display cases, bright lit, dot the room, holding everything from large, custom show pieces to sterling silver earrings to loose gemstones awaiting their fates. I met Logan and Carolyn of Hunt Country Jewelers at a GIA event some months ago. After chatting with Carolyn for a few minutes, I complimented her glasses frames: they were gold colored, with pretty little details. She responded, “Oh, thanks! My husband made them,” and then proceeded to tell me how she was tired of needing to have bent glasses frames repaired, so her husband simply made her a pair out of actual gold so that he could fix them himself at his jewelers’ bench whenever necessary. If that doesn’t make you want to meet these people, you’re reading the wrong blog. The ring above features a tanzanite that Logan and Carolyn brought back from their honeymoon (didn’t you visit gem mines on your honeymoon?) in a custom-made setting that shows a tiny wildlife scene: here in the foreground you can see a rose gold mama elephant with her baby, in front of the spreading branches of a stand of trees that hold the central tanzanite. Every step of the process – from selecting and cutting the tanzanite to designing, creating, and perfecting the setting – was conceived and executed by a member of the Hunt Country Jewelers family. And when I say “family,” I do mean family: husband and wife Ed and Claire Cutshall were the ones who founded the business, and now their son Logan, and his lovely wife Carolyn are involved as well. That’s three lapidaries and two Gemologists: Ed even holds the patent to a gemstone cut, the Jubilant Crown, and his designs have taken home awards in both the International Pearl Competition and the AGTA Spectrum Awards. In other words: small shop, little town, staggering amounts of knowledge and talent. Logan, following in his father’s gemological footsteps, has even been dabbling in gem importing through his connections at certain African mines. He says he enjoys seeing all the rough that comes through and – even better – he gets first pick of the stones. It only takes one look around the showroom to see that Hunt Country Jewelers is run by people who love gemstones: bright green garnets, vibrant tourmalines, and rich tanzanites stand out among more frequently seen stones like aquas, diamonds, sapphires, and amethyst. Jewelry hunting at the 2016 Original Miami Beach Antique Show. About a month ago, I achieved one of my jewelry dreams: I attended the Original Miami Beach Antique Show. This massive 5-day event draws dealers, buyers, and enthusiasts from all over the world to create one of the most dynamic, treasure-filled antique shows out there – in a location that’s delightful in late January, especially when one has 29 inches of snow at home. I’ve wanted to go for years, but I couldn’t exactly take time off from my day job for “a really cool antiques show.” As soon as I became my own boss, attending the Original Miami Beach Antique Show went straight to the top of my list. Thanks to my antique jewelry fairy godmother, the one and only Lenore Dailey, I also had the great privilege of attending the 2016 Jewelry History Series; two days of lectures alllllllll about antique jewelry. There is nothing like being in a room full of people who are as passionate as you are about your favorite thing. It made my nerdy little heart sing, and my new knowledge lent greater context to the treasures I would see over my days at the Original Miami Beach Antique Show. It also gave me a chance to get to know some of my favorite Instagram buddies IRL, which was a wonderful added bonus. And to try on said buddies’ jewelry. These antique diamond earrings of my dreams are better known around Instagram as the legendary Olsen twins, property of the incandescent Grace Lavarro. So: my brain primed with knowledge, glowing with the wonder of having touched the Olsen twins (you know what I mean), I set foot onto the floor of the Miami Beach Antique Show within 10 mins of opening on the first day. And oh my goodness, the treasures I saw. Meajean Vintage is a store I’ve mentioned before, more than once. These vintage-loving sisters have an incredible selection of costume and fine jewelry, both vintage and antique, ranging from less than $30 to about $1,300. It’s one of the online jewelry stores I check regularly and I always find something that I love. Their stock is always beautifully photographed, which is something I appreciate even more now that I’ve spend so much time experiencing firsthand how hard it is to take decent photos of jewelry. 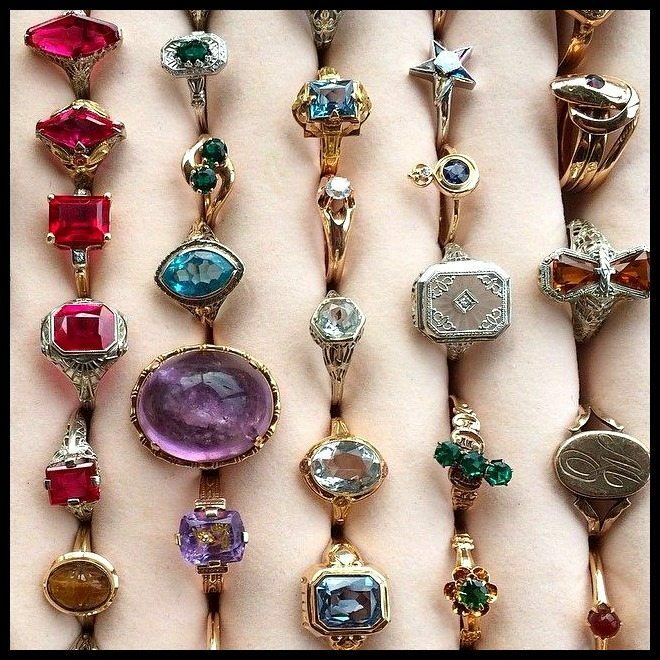 Speaking of photos: Maejean Vintage has a fabulous Instagram account, too. And if you like something they post, don’t wait for it to come up in their shop: I’ve seen more than one piece of theirs snapped up before it even made it into the shop. You can also follow their behind-the-scenes adventures on their blog. Enough talk. Let’s look at some of my favorite pieces currently available in the Maejean Vintage Etsy store. 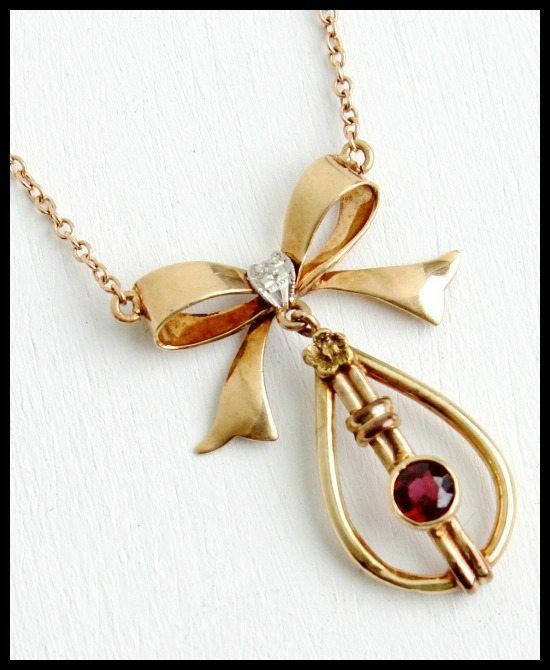 Maejean Vintage has three categories of particular excellence, in my totally biased opinion: pretty little antique necklaces, gold lockets, and pretty little antique rings; all of which I usually want to buy and which are often in my personal Kryptonite price range of $150-$450. 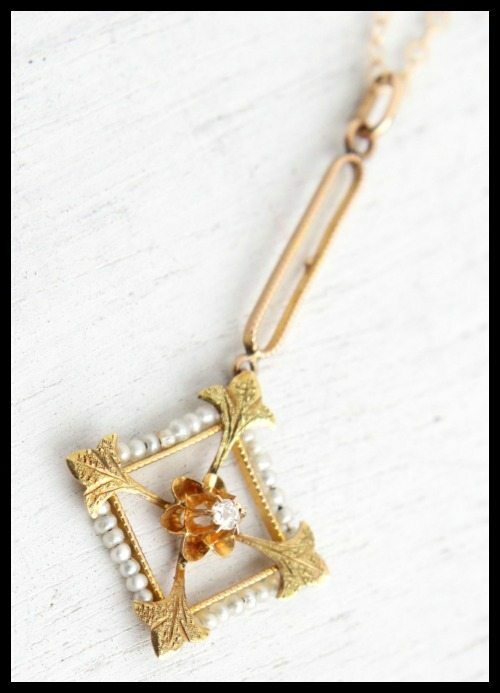 This 1930’s-1940’s lavalier is a great example: it’s sweet, lovely, eminently wearable, and under $400. 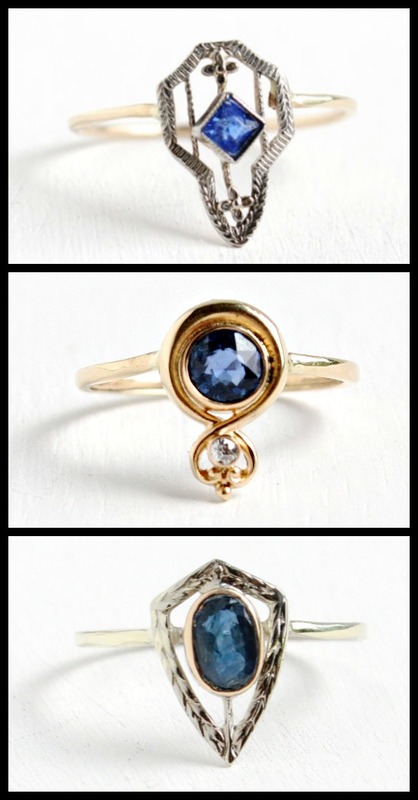 I’m severely lusting after these three sapphire and diamond rings. This trio began their lives as antique stick pins, but have been converted into rings. They’re tiny, lovely, unique, and extremely wearable. 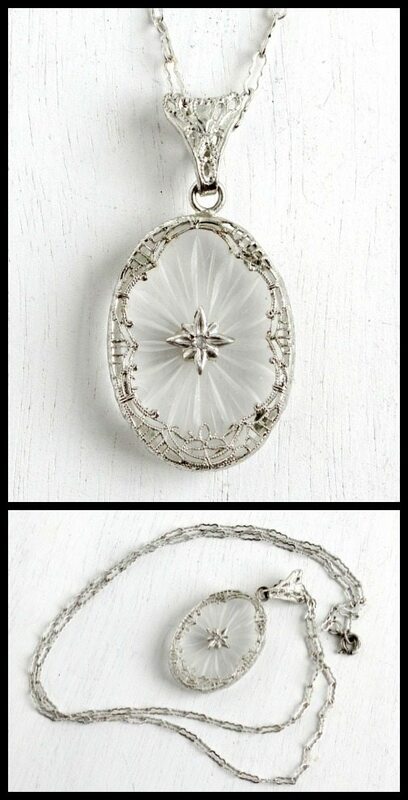 I wouldn’t be surprised if this Victorian two-sided agate fob necklace sells before I get this post online. It’s just so cool – and so affordable. I want it for myself. This may be a very dangerous Store Profile for me to be writing. 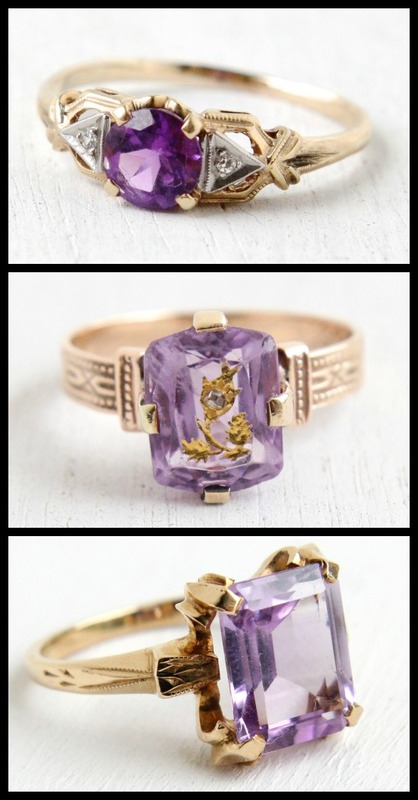 A trio of gorgeous antique amethyst rings. 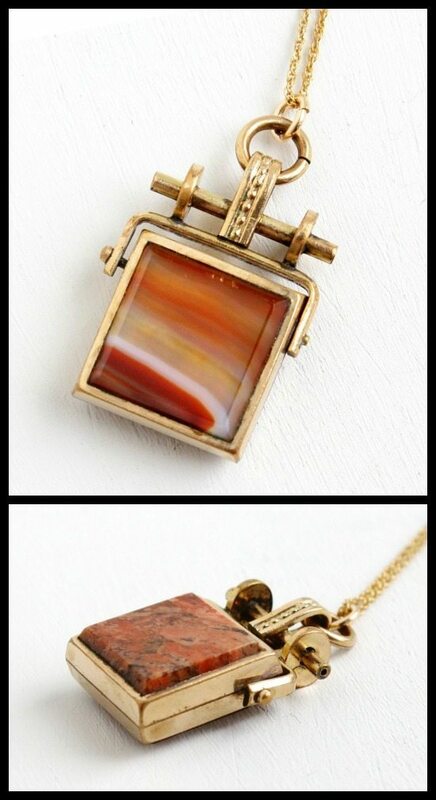 Maejean Vintage is also a pretty reliable source for antique camphor glass necklaces, which you know are something that I can’t get enough of. I’ve considered buying this particular one more than once. Just look at that delicious paperclip chain! I’ve resisted so far. Maybe it’s meant for one of you? 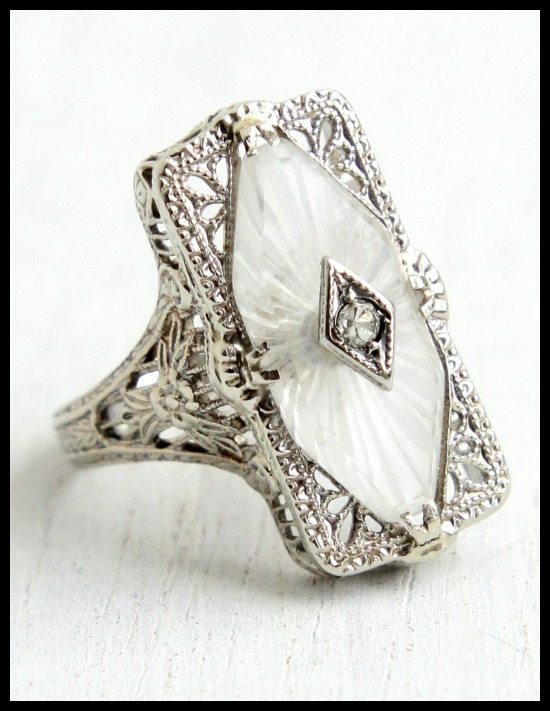 Or how about this 1920’s ring to go with it? I haven’t added one of these to my personal collection yet, but it’s definitely occupying a spot on my ring bucket list (a list that Mr. DitL is wont to make gentle jokes about with fear in his eyes). The more jewelry I look at, the more I lean towards unusual pieces. 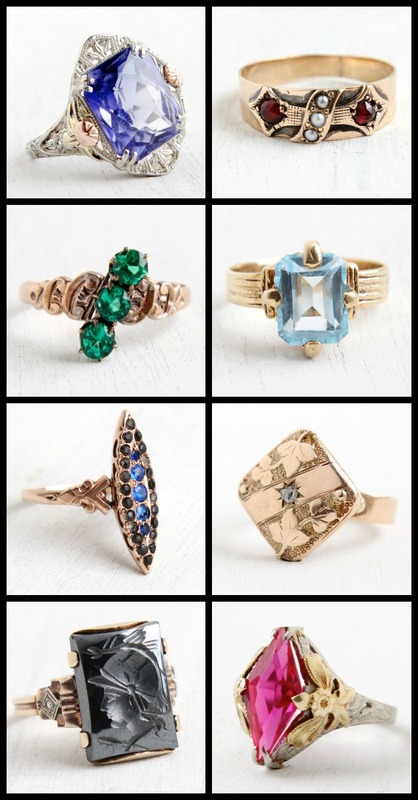 I adore all of these charismatic antique rings, especially the little garnet and pearl Victorian band and the Roman warrior hematite. Could this guy be any prettier? I purchased a lavalier somewhat similar to this at last year’s Baltimore Summer Antiques show last year and I wear it alllll the time. People stop me on the street to ask me where I found it. 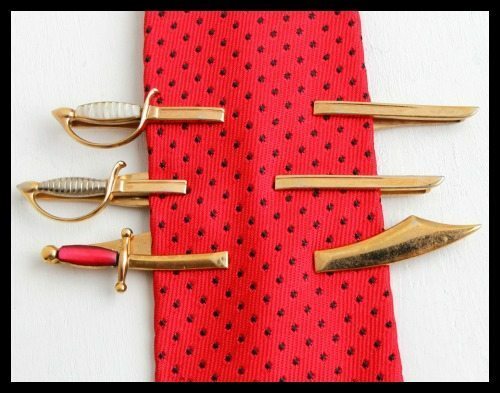 If you wear ties and you don’t own any sword-shaped tie clips with which to adorn those ties, you are squandering an opportunity for awesomeness. Anyone looking for a modest but still stunning engagement ring would be well served by checking out Maejean’s stock. This is only a selection of the currently available diamond rings, not a one over $1,500. Now the most exciting part: check back this afternoon for the chance to WIN a beautiful piece of antique jewelry from Maejean Vintage in honor of my 2 year blogging anniversary, which happens to be today!!! All images and info in this post are thanks to the fabulous Maejean Vintage.